Well it’s the day after Christmas and I feel like Toys R Us threw up in our living room! I’m overwhelmed with all the toys Madeline got for Christmas…she’s spoiled to say the least! This was the first time I had made pecan pie. 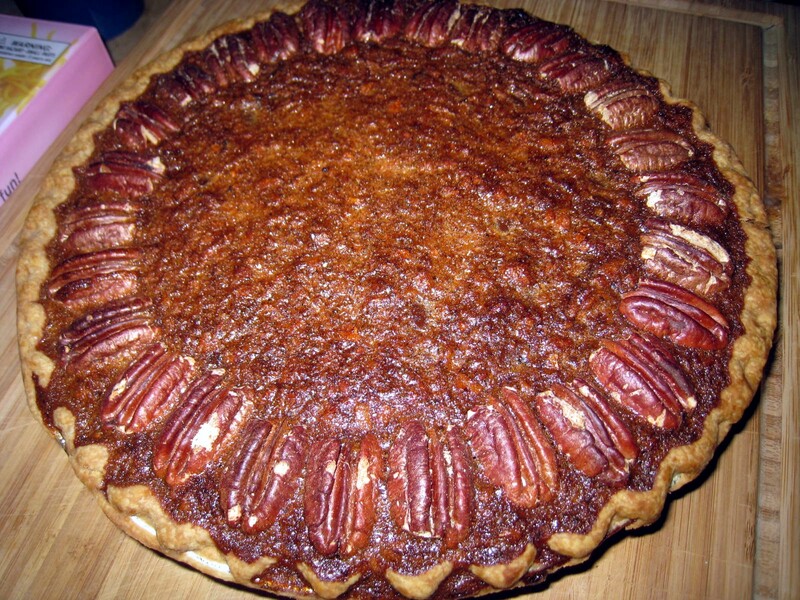 I didn’t want to make a traditional pecan pie and wanted to add another flavor – chocolate. I mean who can really go wrong when chocolate is added! . I made this for Christmas dessert at my in-laws and found out that my father-in-law loves pecan pie…great. I was worried it was a little too wet in the middle and cooked it longer until it was set. BUT it was perfect! It was gooey but not too gooey or sweet. I had lots of compliments and my father-in-law told me that if I wanted to practice making more pecan pies, he’d be happy to be my taste-tester. I have to thank my friend Megan for sending me fresh pecans. They are amazing! Mix together eggs, sugar, salt, honey (or corn syrup), butter and vanilla in a large bowl. Stir in the chopped pecans and chocolate chips. Pour the mixture into the pie shell. Place the pecan halves on top in any arrangement that your little heart desires. 🙂 I just went around the outside. Bake at 425 for 15 minutes. Cut a ring of foil to fit over the rim of the pie pan and place over the edges of the crust to prevent browing. Reduce heat to 350 degrees and continue baking until top is lightly browned for about 30 minutes.